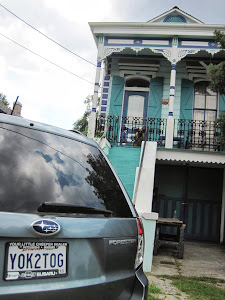 I am about to take off on a road trip from the Deep South, New Orleans, to the furr north. Maine, or maybe Nova Scotia. Along the way, I'll camp and visit yarn stores and fiber events and introduce you all to them. I haven't planned too far ahead, because the point of this particular trip is to see what comes up along the way, both from your suggestions, and those of the folks I meet along the way. I invite your ideas about places to visit and write about. Tips for places to camp or stay are welcome, too. Just a brief introduction (ok, family, I realize you already know I'm a compulsive knitter from way back. But maybe some new people might read this, too!) I knit and I love yarn. And knitters. I also appreciate other fiber arts, such as quilting, but I only seem to have time to knit. Currently I'm taking a break to knit and travel and blog. I have two dogs, a cat, and two awesome kids, Jamie and Marie. They are grownups now. Finally. Mostly. This blog is dedicated to my first born daughter, Vi, who was a writer and a traveller, and spun many a tale herself. I am posting some of her writings on the page, Vi's Tales, which you can find on the link at the upper right. Sadly, many of her stories are no longer around. If anyone has any, please send them on to me and I'll post them for all to read. Thanks. OK, the trip..... It is a dangerous start because I'm heading for Asheville, NC, which appears to be a mecca for yarn stores, artisan crafts, and the like. It appears that there will be many temptations. The list of participating yarn stores in last May's Asheville Yarn Crawl included 9 stores. Count them, nine. (I think NOLA has 3) And this coming Thursday through Sunday, July 18 - 21, in Asheville is the Crafts Fair of the Southern Highlands. Lots of vendors in all sorts of crafts, including fiber. Will there be yarn??? I wouldn't be surprised. I am going to build a special case for my credit card that only opens 24 hours after I first try to unlock it. That way I will have time to decompress and think things through. I'm aiming to camp in the surrounding Appalachians if the weather is ok, but the super rainy weather apparently has washed out a bunch of roads. Again, I'm going to play it by ear, and I'll keep y'all posted. Heading out Wednesday, toward Atlanta, where I'll spend a night before arriving in Asheville Thursday. Anyone with a suggestion of a good place to spend a night (not camping) in Asheville please comment. Oh, yeah, I'm taking my kayak. Yippee. See you soon. Wait! You left something behind...me! © Ann Houston Butcher. Simple theme. Powered by Blogger.